Whether you have your Spring Break fast approaching this month or it is just around the corner in March, it is undoubtedly on everyone’s mind. Your little ones are probably excited for the break from the hustle and bustle of school time routine. You may be wondering what you are going to do to keep your children busy and maybe even avoid the bickering that can occur when cabin fever sets in. Some people use their Spring Break to venture away somewhere on a trip abroad to a sunny hot spot or even to a vacation spot more local to them. Whether the far are near, there is a road trip to get there and as parents we are always trying to find new ways to keep our children occupied and having fun while in transit. There are the traditional eye spy games, the see who can be quiet the longest game 🙂 and of course signing to children’s music. All great activities but they might not last for the length of the trip. * There is always to electronic devices that can keep your children busy, but not all of us can use them while in motion without turning a little green. Not all parents like their children staring at an electronic device for too long either. But if you have one, it will likely keep them busy for a while. * Puzzles, activity books, coloring books with washable crayons. * New items to explore that you surprise them with from the dollar store. * For airplanes, I suggest a Ring Pop or lollipop to help with the ears popping. * Magnetic scenery games and toys. * Challenge them to create pictures as you go along to combine at the end to make a scrapbook of their trip. * Silly Putty. I never knew that Silly Putty could keep my children busy in the back of the car for so long. I could keep going on but hopefully one of the ideas above helps to make your travel a little easier. Some of us though like to use our Spring Break for a break with the theme to be rest, relaxation and a true break from having to run around. We refer to these type of breaks as Staycations. I love Staycations, but it is true that if the little ones get cabin fever then they can start to bicker a wee bit. So we need to keep them busy and having fun and unfortunately Spring Cleaning their room is not their idea of fun. We like to go for walks, have friends over, do arts and crafts, play board games and other similar activities when we decide to have a Staycation. The one common thing with Spring Break is snapping those photos to capture our family moments. If your children are old enough, one of the best ways to keep them entertained is to ask them to snap a few pictures. You might have a wonderful picture of their shoes or a video of the road as you drive, but I bet that there will be quite a few pictures in there worth keeping and that will make you smile. Kinder Canada knows about sharing moments. Every Kinder Egg is more than just a chocolate egg, it also has a little treasure in the form of a toy inside. Kinder Canada has new toys for 2012 inside their Kinder Eggs and you are able to take a sneak peak of them in their New Toy Gallery on Facebook. Which new toy is your favorite? 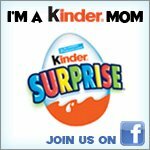 Kinder Canada is also helping to celebrate your shared moments with My Kinder Moments. Every time you frame a shared moment of joy with My Kinder Moments, you’ll also be entered for a chance to win. This month’s awesome contest – $500 towards a family staycation! Happy framing to everyone and we are wishing you all a wonderful Spring Break filled with treasured, shared moments.